Stop by our hibachi grill tonight! Love sushi? Great! We have the place for you! Don’t like it? Don’t worry. We have the place for you, too! Teppanyaki Grill, Sushi & Supreme Buffet in Bridgeport, CT is an all you can eat buffet, sushi bar and hibachi grill all in one! Offering more than 250 choices of Japanese, Chinese, Italian and American cuisine, there is something to please everyone. We're the restaurant in the Stratford, CT area that's sure to please everyone. There's no dining experience quite like Teppanyaki. If you've been to every hibachi grill in Connecticut, or you're not even sure what a hibachi grill is, we're confident that you'll find something new and exciting to love when you're with us. Our talented chefs will prepare your dinner right in front of you, dazzling you with their speed and skill while also preparing a delicious meal for you to enjoy hot off the grill. No matter what you order, it's always an enjoyable experience with us! Our Sushi Bar and Hibachi Grill Has Something for Everyone. If you'd rather sample our sushi bar, then you'll be amazed at the selection and the freshness of the ingredients. Sushi can be simple or complex, but across the board, many other restaurants struggle to get it right. Here at Teppanyaki Grill, Sushi & Supreme Buffet, we've perfected the art of sushi. Stop in today and taste the difference for yourself. Not in the mood for sushi? 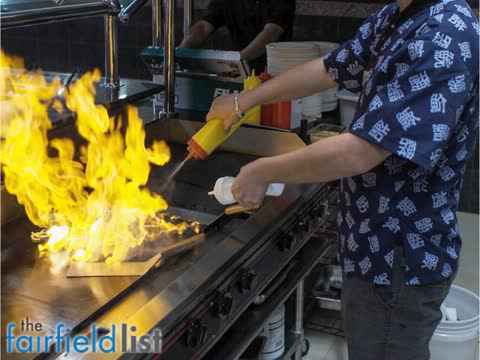 Try our hibachi grill. Patrons come from all around the Stratford, CT area to sample what’s on the menu. But while the food is fantastic, you get more than just a meal at our hibachi grill. You can also watch our talented chefs cook your food before your very eyes. You’ll be able to enjoy dinner and a show! There are few better ways to spend an evening or afternoon. And, if nothing else pleases you, we feature an extensive all you can eat buffet. Even the pickiest eaters will find something to love in our buffet, which features the best cuisine from all over the world. Teppanyaki is a great place to bring your family, a date, or just yourself, and be confident that you'll leave full and satisfied. You won't find a better sushi bar in the area! When you want sushi, nothing else is going to cut it. And when you want the best sushi around, then there's only one place to go: Teppanyaki Grill, Sushi & Supreme Buffet. From your classic rolls to delicious sashimi to modern twists on old favorites, we have something for the novice as well as the connoisseur. At Teppanyaki & Supreme Buffet we serve a creative blend of Japanese cuisine that brings together a daring and delectable fusion of flavors to the sushi bar. The menu presents a fresh selection of nigiri, sashimi, and sushi rolls influenced by Japanese culture with an original twist. The sushi bar experience is complemented by the casual yet trendy ambiance of the restaurant. Visit us at 204 East 43rd Street (between 2nd and 3rd Avenue) in Stratford, CT for a unique experience. At our hibachi grill and sushi bar near Stratford, CT, the food is always fresh. You'll be in awe as our professional teppenyaki chefs create dazzling meals right before your eyes. Preparing your meal is about more than just cooking your meats and vegetables to perfection. It's a work of art at our hibachi grill. All-you-can-eat portions of your favorite hibachi cuisine. At this all you can eat buffet, you will have an extensive selection to browse from its amazing sushi bar and hibachi grill. Some of the most popular dishes include teppanyaki chicken, beef tenderloin, Italian shrimp and more. There is also a salad buffet with fresh vegetables, toppings and dressings. Families will appreciate the kid-friendly foods such as pizza and mashed potatoes. Don't forget to save room for desserts, including fresh fruit, pastries, cookies and a large ice cream bar with several flavors. Loyal customers of our sushi bar range from business professionals to families in and around Bridgeport, CT and Stratford, CT. People know that at Teppanyaki Grill, Sushi & Buffet, they can get healthy food without a wait – a great alternative to fast food restaurants. Dinner starts at 3:30 p.m. and the restaurant is open until 10:00 p.m. from Sunday through Thursday and until 11:00 p.m. on Friday and Saturday. From Bridgeport to Stratford, we're the best. Experience the best sushi bar and hibachi grill in Stratford, CT and Bridgeport, CT today. With such a wide selection of sushi, meats, and vegetables to choose from, you are sure to find something you like! Our all you can eat buffet will fill you with delicious foods for an affordable price. So if you want to ensure that you have a dining experience to be remembered, make it Teppanyaki Grill, Sushi & Supreme Buffet. No other restaurant in the area offers the kind of value and quality that we do. Indulge yourself at our all you can eat buffet, or order quality sushi and hibachi that is freshly prepared to your specifications. Everyone goes home happy at Teppanyaki! Come on in and try it, and you will start to book your future events here! Our all you can eat buffet features over 250 Japanese, Chinese, Italian and American items that have to be tasted to be believed. If you order from our hibachi grill, you'll be treated to a cooking demonstration as our professional chef prepares your chicken, beef tenderloin, Italian shrimp or whatever item you desire. Try our sushi bar, or bring the kids in for our ice cream bar. We offer a private room for special events.